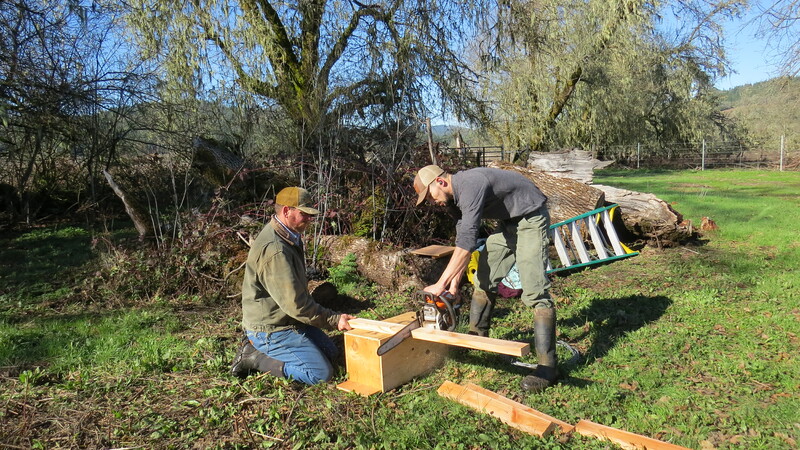 Today I am excited to be able to help one of our volunteers, Jayman Cooper, and our Project Assistant, Jake Stubberfield move some wood duck boxes, we had put up last year with the help of our Project Manager, Chris Bartow, from an area along Outlet Creek, out to an Ash tree woodland in the north end of the valley. 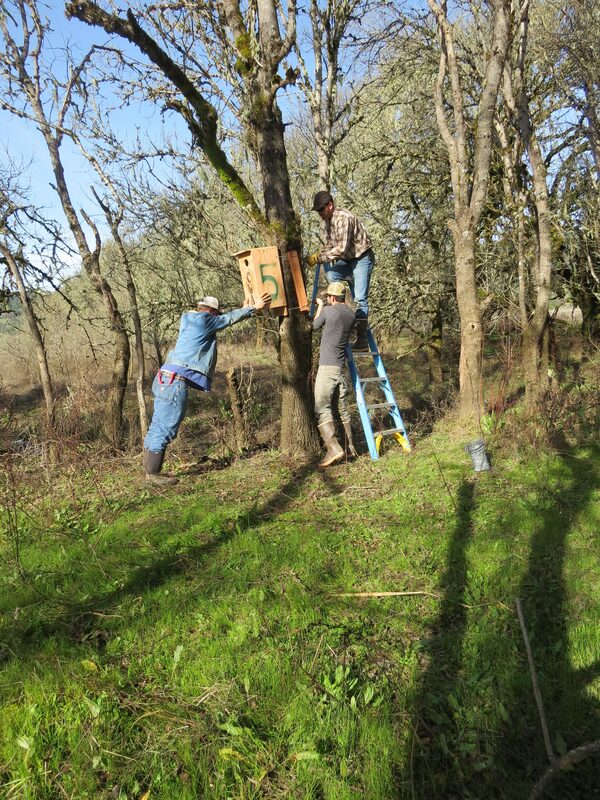 This area is where we had the successful nesting box from which we posted the videos of mother wood duck and babies. It is a beautiful warm January day with a bit of ground fog still along the creek and in the valley. Jayman and I walk along Outlet Creek and try to decide which boxes need to be moved. From the wildlife camera videos, we learned that the ducklings need flat ground under a tree that is close to a waterway and has some cover to protect the ducklings. It can’t be too much coverage because it would make it difficult for the ducklings to make their way through. These little ducklings, at only 24 hours old, when they hear a call by their mother, crawl up the 2-foot deep nest box to the opening, and fling themselves out into the air. They are about 5 to 6 feet above the ground. Then they have to make it safely to water, where once again they dive in without ever having been taught to swim. Looking at some of the boxes we put up last year we find at least 2 that do not fit the criteria. They are above the water at least 10 to 15 feet with branches in the way and no “ground” for the ducklings to land upon. We remove one and walk over to the place where Jake is removing another. He has found the number one box full of a hive of honey bees and before he has figured out they are not yellow jacket wasps, the box has fallen in the creek! Jayman and Jake haul the box out and we are amazed to see the honeycomb filling the box. We are sorry to have inadvertently drowned this hive and hope that the group of bees that flew out, find a new home. We put these two boxes in our truck and take them to the north end of the valley. As we are putting up the transplanted boxes, so much is going through my mind. We want more than one box to be successful this year, therefore, we consider the options carefully. The box needs to be easily accessible by the mother duck but not too exposed. There needs to be a soft landing for the ducklings near water. Finally, we find 2 more good sites in an ash grove not too close to the other successful box but in the same general area. 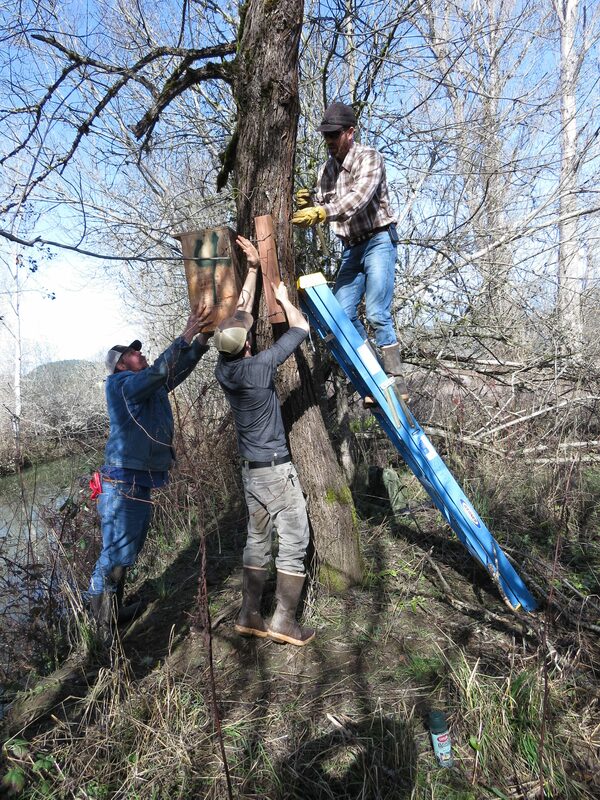 We then work quickly together to safely secure the boxes. The area is quite inundated and several times my boots fill with water. Wearing waders would have been a good idea! 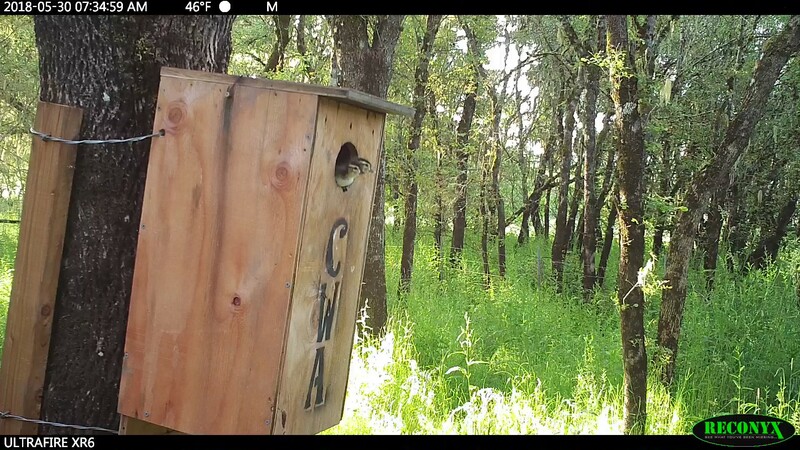 These boxes are at least 1/2 mile from Outlet creek where the tiny ducklings and their mother, from the video box we video recorded, ended up. Now we still have 2 more nest boxes to put up but will need to wait for waders and maybe less water depth. 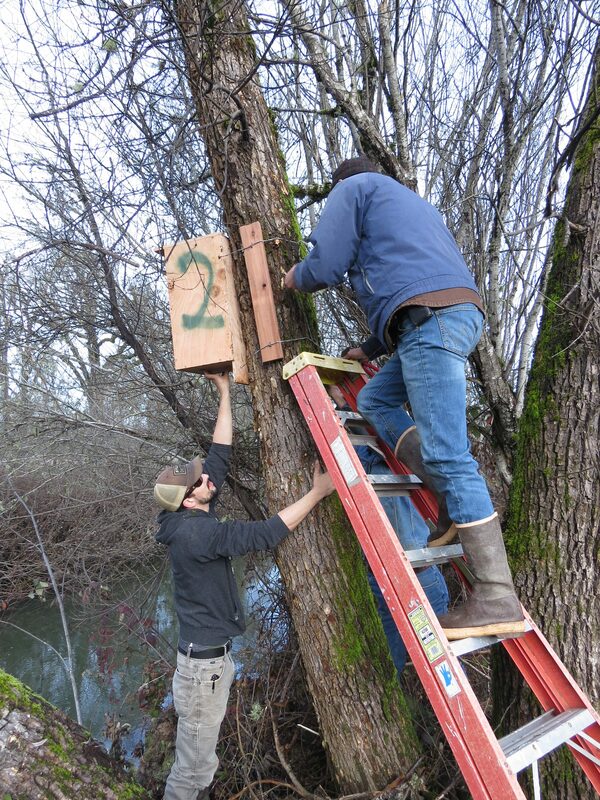 It feels good to try and help Wood ducks be successful at nesting in our area since deep cavities in oaks and other trees are hard to find.